After two or three generations, the Pueblos decided to rid themselves of the Spanish and return to the pre-conquest days. 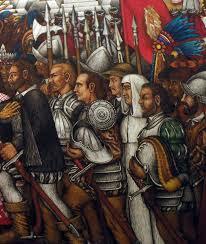 Several pueblos rose up in a coordinated attack on the Spanish and drove them south in 1680. It was a remarkable feat and they reaped twelve years of peace. 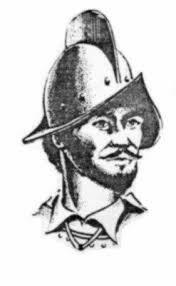 But in 1692 under the leadership of Don Diego de Vargas the Spanish returned to retake Santa Fe and their abandoned Palace of the Governors. The Palace had been built on top of Tesuque Pueblo, and the pueblo warriors were ready to defend their traditional homeland. Although on that first day the sight of a canon convinced the Indians to retreat, the re-conquest of the area took three bloody years of battle. With conquest complete, Pueblos and Spanish settled into co-existence. The pueblos were probably resigned to this new way of life, and the Spanish were probably somewhat more respectful neighbors, now knowing that expulsion was possible. Today, over 320 years later, Pueblo Indians, Hispanic descendants of the conquistadors, and newcomer (1800s) Anglos live in relative harmony. Conquests and subsequent exploitation may be distant in terms of years, but how this history is remembered is critical today. In Santa Fe, a commemoration dates from 1712, when the Spanish proclaimed an annual celebration of the shared faith of Spanish and Pueblos. With some interruptions a statue of the Virgin Mary, called La Conquistadora (which had come with the cannon in 1692), has been carried every year from her home in the cathedral to the plaza and returned. In 1911 in an effort to increase tourism in Santa Fe, an Episcopal priest added the entrada, to the event. This was a re-enactment of the supposed “peaceful re-conquest” of Santa Fe in 1692, complete with a local Hispanic dressed as DeVargas riding into the plaza with his men on horseback, and then meeting a local Pueblo Indian who kneels before the conqueror, and is touched by a sword on his shoulder while DeVargas makes a speech. The speech credits La Conquistadora with the bloodless re-conquest. 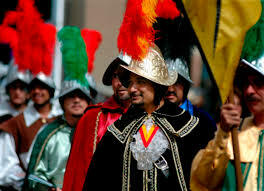 The entrada is only a part of what is the three-day Fiestas de Santa Fe in early September, but it has been the center of controversy for many years, as Pueblos are increasingly distressed with what they see as a humiliating and inaccurate version of history. 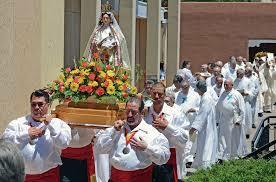 The Caballeros de Santa Fe, the fraternal organization that produces the entrada every year is devoted to their belief that the re-conquest was bloodless, thanks to La Conquistadora’s miracle. The Santa Fe Fiesta Council, responsible for the larger celebration of which the entrada is a part, has been unable to resolve the conflict. Local elected leaders have promised to address the issue, with no success. 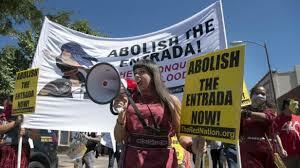 Last September, frustrated Indians and their supporters interrupted the entrada in a protest that resulted in arrests. Again there were letters and editorials, promises and threats, criticism on all sides. Would we be facing an escalated protest in 2018? 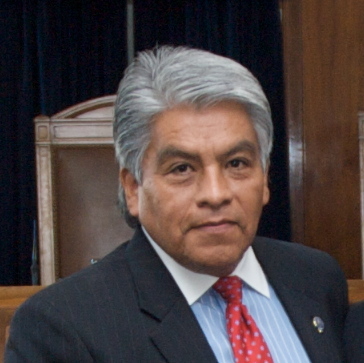 Enter Regis Pecos, a former Cochiti Pueblo governor, a Princeton graduate, a lawyer, and founder of the Leadership Institute which nurtures young Natives and Hispanics to draw on their cultures, histories and communities to become leaders. In addition, he is, in my opinion, a miracle worker. Regis brought together representatives of the All Pueblo Council of Governors, the Santa Fe Fiesta Council, the Caballeros de Santa Fe, the mayor and the Archbishop of Santa Fe, and met behind closed doors for several months. All present agreed that Regis would be the sole spokesperson for the group and that everything said would remain confidential until an agreement was reached. This was critical since any leaks could have spurred supporters of one side or the other to threaten the process. Pueblo reaction ranged from “humbled and grateful” from Elena Ortiz of Ohkay Owingeh Pueblo, to “super happy” from Jennifer Marley from San Ildefonso Pueblo who was arrested last year. There are also some cautious “wait and see”s. The Caballeros are planning on an alternative celebration on the plaza during Fiestas, without the re-enactment or mention of the conquest. Regis said there are also plans for a series of events before the kick-off of Fiestas “to commemorate the negotiations of reconciliation.” I am hopeful that this September will bring us a peaceful celebration of the resolution of a nasty conflict. As a mediator, I am full of admiration for Regis. This was as intractable a conflict as any, rooted in a long and painful history. Adding to the challenge, there are two starkly different versions of that history, one of which has become entwined with the belief in the power of a statue. Further, it is unusual for a conflict to be mediated by someone who belongs to one side, but Regis was obviously able to gain everyone’s trust. I am guessing he showed a sincere respect for all present and a deep appreciation for the impact of history. He makes me believe in miracles. Great Story! Thank you so much for sharing it with your insight! Thanks, Marguerite. Yes, being a mediator gives me great appreciation for what was accomplished. I too am heartened that such a compromise could be reached, given the entrenched beliefs and emotions on the various sides of this issue. It is particularly hopeful at a time when our larger American community is riven by intractable ideological posturing and efforts to “win” at all costs. I say this as a citizen of Charlottesville Virginia where just a year ago disagreements about the handling of a statue of Robert E. Lee in a public city park resulted in massive ugly demonstrations, conflicts, and death of a young woman. The intense passions exhibited here—- as across our country—- have made discussion of a complex history of slavery and it’s unhealed aftermath, now more than 150 years ago seemingly impossible. Yet, miracles do happen, as your story attests. When people choose to become human and less ideological, it is still possible to accomplish a new thing. We are larger than our myopic view of our collective history. Thank you for your reminder. I was thinking about Charlottesville as I wrote this, and the many other places in the country suffering deep divisions. I agree that what it takes is the courage to see each other as fellow human beings and drop the rhetoric and ideology. I wish for a miracle for your community, for your own Regis to step up and lead the way. Wonderful post, Lucy. Regis needs to be recognized for this achievement once the dust settles. All I can say is wow!!! We’re lucky to live in the same community as Regis — we can at least take him out to lunch! What a wonderful an insightful post, Lucy! Always makes my day to read some “Good News” for a change in our current political climate. All my best, keep up the good work! Thanks, Linda. There is also a great profile of Regis in today’s New Mexican at http://www.santafenewmexican.com/news/local_news/a-respected-s-f-power-broker-with-humble-beginnings/article_67b4ea99-7c9c-570a-b26a-4b96235670ff.html — someday I’ll learn how to make short links…where is Jack when I need him?! be resolved into a peace and reconciliation commission to celebrate the human recognition of a desire for settling such a loaded historic ritual, — the entire process is so full of the human respect shown each, a kind of respect we are all so yearning for. I am also grateful to our mayor. He is also a wise and mature facilitator and nurtures dialogue that leads to resolution. I join you in celebrating the importance of this. You’re right. Many good people played a part in this. Did you see the New Mexican this morning? such an interesting profile of Regis. Regis is an incredible friend. Just last month he and the Leadership Institute staff brought the power of each pueblo for all to agree on Yazzie vs. State, on school funding issue. When Regis expresses everyone listens. Would love to see him receive an honor recognize by every Pueblo and State legislature. I celebrate him. Thank you for this wonderful information, Lucy Moore. I totally agree, Kirby. Thank you for your comment. If there is anything I can do to help bring that honor to reality, please let me know. And yes, he is a wonderful friend, as well. Lucy: wonderful post. Thank you for this history, wisdom and insights. Thanks, Nedra. I love that although we mediators think of mediation as a profession, it is really just people helping each other find solutions, make peace, and heal. beautifully written, lucy….insights and appreciation from your profound and special perspective as a mediator over decades. I felt great about this – then saw the news about the “alternative” and didn’t feel so good – and now, reading your article about Regis’ role, feel good again. Thanks, Lucy! I have the same low level anxiety about the “alternative” planned by Los Caballeros, but am holding the faith that all parties came to a meaningful resolution and will treat each other with respect come this September. Shil bahozho — hozho nahasdlii !! Beautifully written and grateful for the final result. Shik’is! of course. All I could think of was shada’ni — in-law? Our community truly does have the opportunity to be the bellwether on what is possible for our fractured nation. Regis, the Caballeros, our Mayor, and other participants deserve the credit for the conversation and the agreement, but the spirit of reconciliation lives within all of us. We simply need to keep our hearts and minds open for the healing message of consensus. Good report Lucy! Thanks, Kim, for that all important reminder that the spirit of reconciliation does live within all of us. Sometimes it gets buried under so much fear, resentment and anger it’s hard to give it the breath it needs. Great story Lucy. Thanks for sharing. Maybe there is hope for compromise in Washington, D.C.
That’s what I love about you — your optimism! Thanks, Mike. I got an email from Regis who said that he helped the group very slowly “peel away layers of colonialism” and find common values. That was the key. Pretty profound. Good story and a wonderful example of the power of personal dialogues. Do you think these negotiations work only on the local level? I’m thinking of the racial tensions in almost every community in the country. Do you professionals have a standard of how big the community can be to effectively resolve an issue? Excellent question, Jane. I was going to say the smaller the better and then I thought of divorce mediation — which I don’t do for a reason. (often too nasty) For these bigger conflicts I think you need a critical mass to find a reasonable solution, to bring the extremes toward the middle. It takes a lot more resources and commitment from leadership to pull it off on a big scale — like South Africa, where there has been a healing and reconciliation process, or Rwanda. The Santa Fe example was perfectly orchestrated, in my opinion: the right mediator who had credibility (as a Pueblo Indian and a devout Catholic) on both sides, committed leadership (Mayor, Pueblo Governors, and Archbishop), a process that was not rushed and was held in private, a common set of values based on love of place, mutual respect, and a willingness to at least think about change.